I’m happy to say that the fabulous Joe Flamm won this season. Yahoo! While I don’t know Joe at all, I do have to say that I appreciate that he’s from my hometown (yeah Chicago!) and that he’s relaxed, fun and funny. What’s not to love!? For his final meal, he served an interpretation of something called Torta Della Nonna. His was actually closer to something that resembled sticky brown butter cake, but it looked pretty darn fabulous. So in honor of him and in honor of my last episode, I attempted Torta Della Nonna. So, like I mentioned, Joe didn’t actually make torta della nonna. What he made looked fabulous though, so I was certain this “torta della nonna” thing was something pretty close to what he made. Um, nope. Not at all. 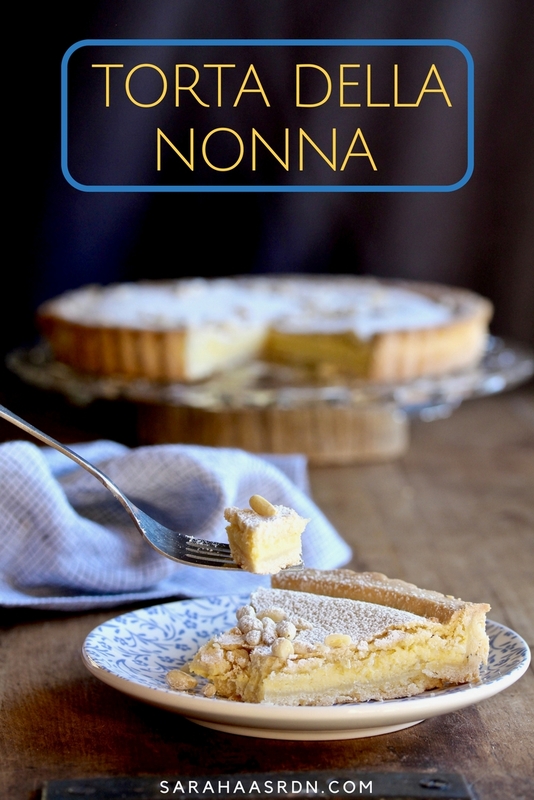 In fact, torta della nonna was REALLY different. We’re talking sweet pastry dough and pastry cream. Oh boy! After much research and cups of coffee, I finally got a version I liked. And now, I share it with you! Hope you enjoy! To a large food processor, add the flour, confectioner’s sugar, salt and lemon. Pulse a few times to combine. Add the butter and pulse until crumbly; it should resemble wet sand. Add the egg and yolks and pulse until the dough comes together. Remove the dough from the food processor and place on a floured surface. Shape into two discs, one consisting of 2/3 of the dough and the other, the remaining 1/3 of the dough. Wrap in plastic and refrigerate for at least 1 hour and up to 1 day. In a medium saucepan, heat the milk with 1/4 cup of the sugar, the vanilla and the lemon zest until the mixture is hot to the touch. In another medium bowl, whisk the egg yolks with the remaining 1/4 cup of sugar until blended. Stir in the flour until incorporated. Whisk in the hot milk in a thin stream. Preheat the oven to 350°F. Butter and flour a 10-inch fluted tart pan with a removable bottom. On a lightly floured work surface, roll out the larger disk of pastry to an 1/8-inch-thick round. Ease the pastry into the tart pan, pressing the dough into the corners. Don’t trim the overhang. 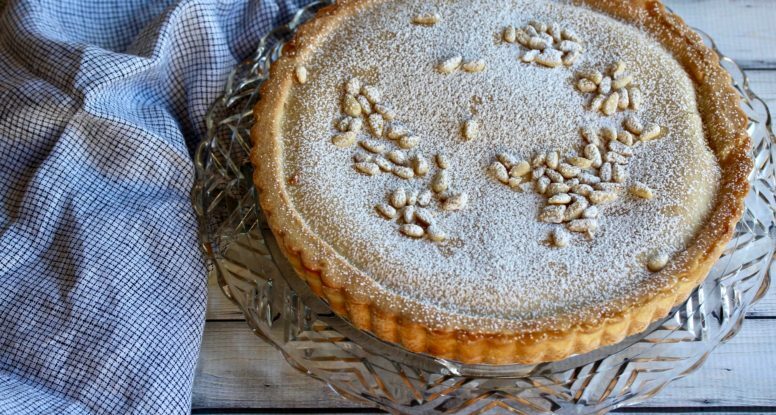 Spread the chilled pastry cream in the tart shell in an even layer. Roll out the remaining pastry disk to an 1/8-inch-thick round and set it over the tart; gently press out any air bubbles. Carefully roll the rolling pin over the tart pan rim to cut off the overhanging dough. Gently press the edge together to seal the tart. Bake the tart in the lower third of the oven for about 40 minutes, rotating the tart pans halfway through baking, until the crust is golden brown. Let the tart cool completely in the tart pan. 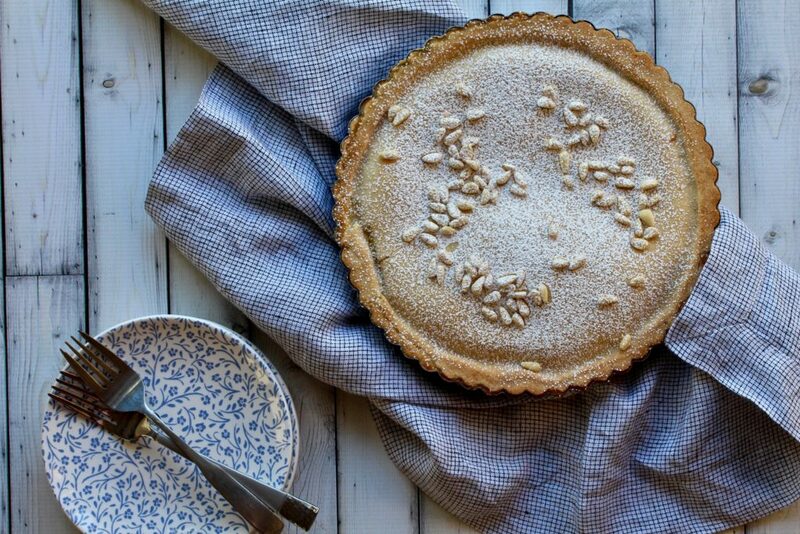 Unmold the tart and transfer it to a large serving plate. 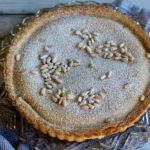 Sprinkle the tart with pine nuts, cut into wedges. Ok totally missed your stories where you were recreating the Top Chef dishes, so need to check them out. This torta looks heavenly! Do you deliver, because I am sure mine would look nowhere as gorgeous as this!